We are lucky enough to have a spotted pardalote pair nesting near the Tilligerry Habitat visitor Centre. This ground nesting bird nests at the end of a short tunnel that they make. We have temporrily sectioned off the area as it is very easy for anyone to stomp over the nest. This bird is not only very beautiful but vital to our environment. 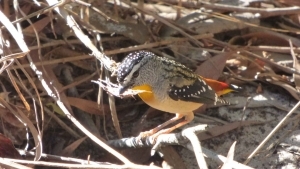 The spotted pardalote eats bugs that favour the swamp mahogany tree. This is the local koala food tree hereabouts. 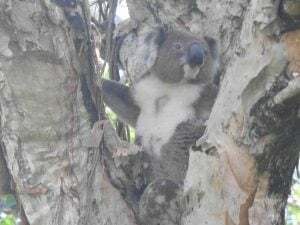 So, without the pardalote, our koala food trees suffer, and so do our koalas.